Welcome to day two of our running program leading up to the VCTC Cancer Challenge at the end of June! Get ready to set a new PR as we incorporate hill repeats, speed intervals, and new intervals! Get faster and leave the old you--as well as many others--in the dust! Intermediates: 6 hill repeats. Find a hill that will take you 45 to 60 seconds to climb. Run up as quickly as you can. Jog down and repeat. Hill repeats are great because they build the power that you need to climb hills, and will make your overall running times faster. If you do not have a hill, you can use a treadmill at an incline as an alternative. Advanced: 4 speed intervals. Run an 800, about 1/2 mile at close to race pace. For example, if you are aiming to run 6:00 miles, run the 800 at around 3:00. Jog for 2-3 minutes then repeat. Do two 400 meter intervals in the same fashion. 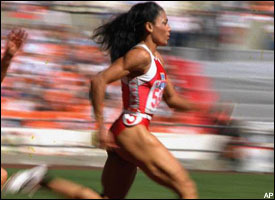 A goal of 6:00 mile would be 1:30 on the 400, with a 60-90 second jog between each one. Speed intervals improve your speed because your body gets used to running at higher speeds, allowing your speed to improve over longer distances.